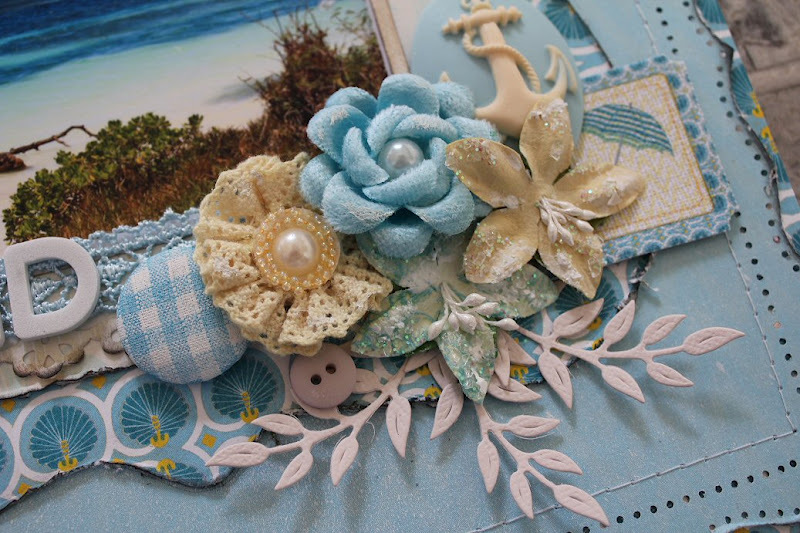 This month I received the super gorgeous Palm Beach range from Websters Pages as my DT kit from Handmade by Suzanne.....which is available in store HERE. I was pleasantly surprised when I received this range...and straight away knew that I'd get a variety of different styled/themed layouts from it...so it's going to be one of those versatile ones! And the laces, tickets & accents to match in this range are gorgeous. Lots of punched border edges, misting, distressing & a few clusters with lots of Prima flowers & some resin pieces from the Websters Perfect Accents pack. A close up of my main cluster...which includes a blue checkered Lil' Red Rocket button....that I covered in gesso to lighten the blue so that it toned in better with the rest of my cluster....I love the washed look that it gives! Title....and a little bit of journaling on strips of CS with foam tape under them to give them a bit of pop. superbe travail !! une belle page de scrapbooking comme j'aime !! a beautiful and amazing layout !! !